SALEM—McNary (16-5, 11-2) again showed it can win close games, defeating McKay 60-59 on Tuesday, Feb. 6. The Celtics will need that fortitude down the stretch as they close the season against South Salem (Feb. 13), West Salem (Feb. 16) and McMinnville (Feb. 20). 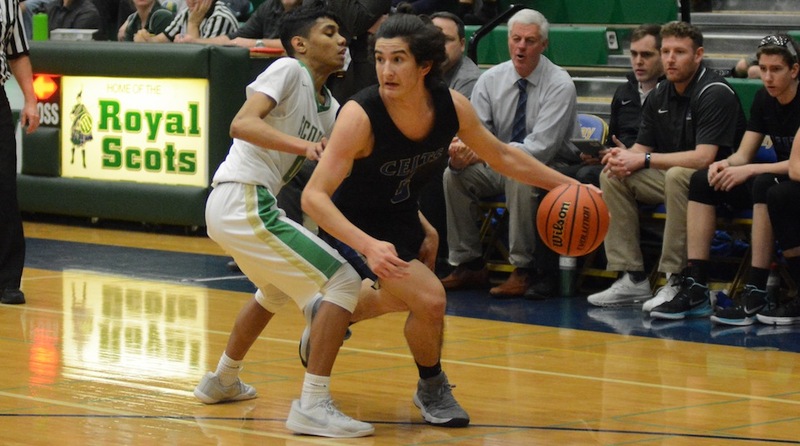 The Celtics defeated all three opponents the first time through league play but needed double overtime at South Salem. West Salem is No. 9 in the OSAA power rankings after giving Sprague its first loss in league play on Tuesday night. McMinnville is 13th. McNary is fifth in the power rankings and must remain in the top eight to host two playoff games. The Celtics fell behind 14-12 in the first quarter as McKay, one of the highest scoring teams in the state, slowed down the pace of play. Adjusting to the tempo, McNary began to take control in the second period and led 31-24 at halftime after a Riccardo Gardelli three-point play at the buzzer. An Andrew Jones 3-pointer stretched McNary’s lead to 36-24 early in the third quarter but back-to-back 3’s by McKay senior Andre Tovar got the Royal Scots within 45-44 with 6:25 remaining in the game. McKay then tied the game at 47-47 with a free throw. But the Celtics found Boston Smith in the paint on two consecutive possessions to go up 51-47. After Tovar drained another 3, Jones found Lucas Garvey for an easy bucket. Alfredo Villarreal then hit a driving Jones to give McNary a 55-50 lead with 1:14 remaining. Villarreal went 4-for-4 from the free throw line in the final 32 seconds as McKay tried to extend the game. After another 3-pointer followed by a McNary turnover, the Royal Scots had one more chance but failed to get a shot off before the buzzer. Cavell and Garvey each had 13 points in the win. Smith added 12. McNary won 56-39 at West Albany on Friday, Feb. 2. The Celtics led 37-32 entering the fourth quarter before outscoring the Bulldogs 19-7 in the final period. Chandler Cavell led McNary with 15 points and seven rebounds. Lucas Garvey added 14 points and three rebounds. Boston Smith finished with 11 points and four rebounds. Andrew Jones had 10 points, four rebounds and four assists. The Celtics host South Salem on Tuesday, Feb. 13 at 6:45 p.m.
McNary’s girls (15-5, 9-3) rebounded from a 62-56 loss to West Albany to easily defeat McKay 59-26 on Tuesday, Feb. 6. Kailey Doutt finished with 25 points and eight rebounds in the rout. Lead Dott had nine points, seven rebounds and six assists. Paige Downer added nine points and six assists. Kennedy Buss added nine rebounds off the bench. Downer and Abbie Hawley led the Lady Celts at West Albany, each finishing with 21 points and five rebounds. McNary plays at South Salem, which it beat at the buzzer the first time, on Tuesday, Feb. 13 at 6:45 p.m.